March 8, 2018 March 9, 2018 by Joanna M.
Last week saw the Digital Marketing Masters students receive a guest lecture from Jason Stewart of Aberdeen International Airport. 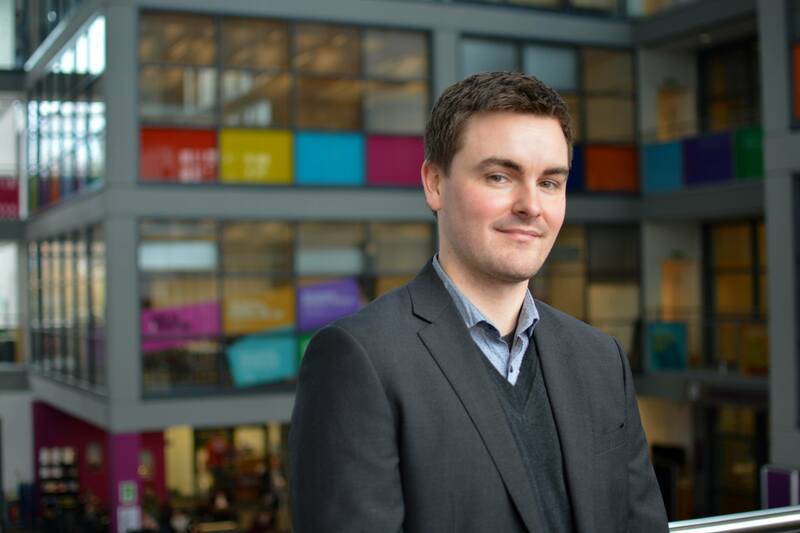 Jason is an E-Commerce and Digital Manager at the airport which has been in partnership with the RGU Digital Marketing MSc since the course beginnings. As a former RGU Corporate Communications student, Jason completed a diploma in Digital Marketing before beginning with the Aberdeen International Airport (AIA) eight years ago. In that time, Jason has been in many commercial roles, with the last 4 years dedicated to e-commerce and digital. We heard some helpful insights into one of digital marketing’s current trending topics, the new General Data Protection Regulations addressing data security. The legislation comes into force this year in May, with a rush from many organisations to update their data storage and make sure they’re complying. This forecasts big changes for digital marketing in how online personal data can be used by organisations. Jason then shared more about his role in eCRM, or electronic customer relationship management. This channel is key in marketing because it involves data handled directly by an organisation, rather than through a secondary platform such as Facebook or Google Adwords. We discussed how marketing and data use must be reactionary. In an airport setting, AIA sends email offers based on customer dates of birth, or send campaigns based on which travel destinations may have previously been viewed by an individual. Personalisation is an important factor in communications. Messages must be as closely tailored to 1:1 communication as possible, using gathered data to determine the message, and timing to the customer. Jason drew his talk to a close by sharing some of his key tips for successful eCRM; have an insatiable appetite to learn new things, and don’t be afraid to challenge the norm when it comes to justifying new digital approaches. We want to thank Jason and Aberdeen International Airport for continued interesting insight and partnership with the Digital Marketing MSc students at Robert Gordon University. What are our other partnerships at The Digital Scot? Read more about our guest lecture with Julie Brander of Weber Shandwick last month. Debating to go back to University?